Dan A. of Idaho recently sent us some photos of his Pronghorn Antelope hunt for the 2016 season. He was using his 300 Win Criterion Rem/Age barrel. 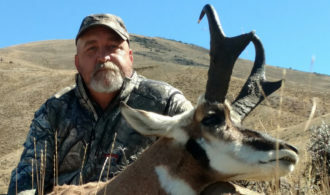 He shot this antelope at 720 yards using 215 grain Berger hybrids at 2865 fps. Thanks for the photos Dan and happy hunting!